Happy Sunday, everyone!! Did you have a great rest of your Saturday? Once Josh got home from Spokane...we headed out to a local brewery so he could get a growler fill & then picked up a bottle of wine for me. We brought them home to go along with our grilled ribeye steaks & sauteed zucchini....YUM! We watched the movie "What To Expect When You're Expecting"...and it was pretty good! So many funny, over the top moments, but also some sad & tender parts. Kind-of like real life, but not. Ha! I have another card to share with you today...I got the chance this morning to just sit in my room & create again, which is so nice. There won't be a supply list for this one, because it is pretty much all Crate Paper. 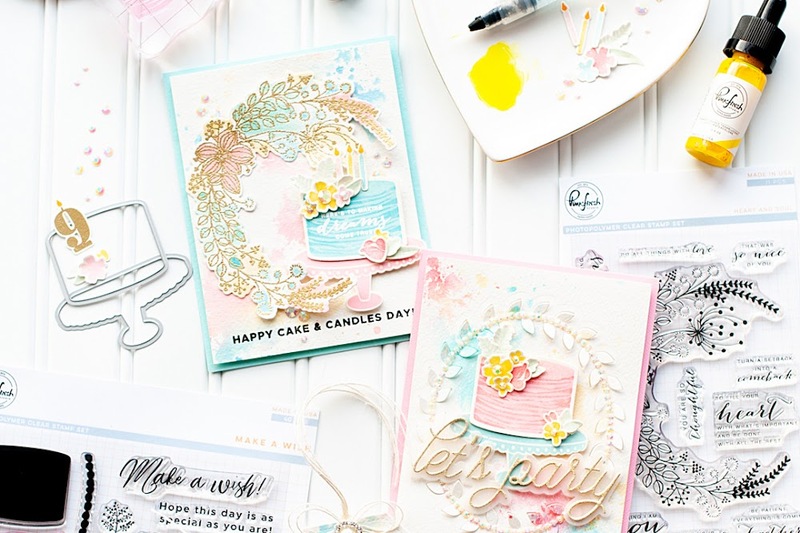 I've combined 4 of their collections on this- Maggie Holmes, Fourteen, Paper Heart, & Pretty Party. The only items that are not Crate are the vintage cream cardstock by PTI, the gold teeny alphas by Glitz Design & the sequins. Check it out! 2. Cut doily paper slightly smaller, then adhere. 3. Cut a strip of pink chevron paper, add a fussy cut doily to the bottom of it, then adhere across the middle. 4. Layer the diecut tags & cutouts to the left side of the card. 5. Add the vellum sentiment banner along with the fussy cut banners & stickers. 6. Frame the sentiment with two glittered brackets. 7. Add the gold teeny alphas above the vellum banner to finish the sentiment. 8. Add the fabric flower to the upper right corner, then accent with sequins. 9. Add the brads to the bottom of the card to finish. Well, there you have it...tons of pink goodness on this one!! I love how easily it came together, and all the fun layers it has! I hope that you like it as well! That is all I have for you this Sunday...I will be back this week with more to share! have a great rest of your day! Oh so pretty, Lea! I love the collage look you have achieved. 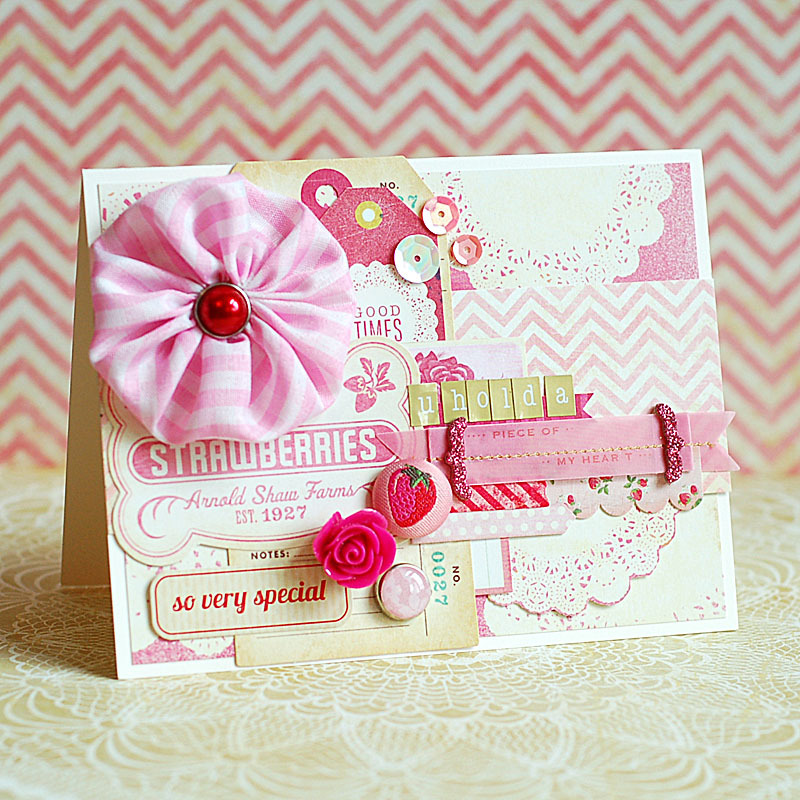 The strawberry brad is the perfect embellishment for the strawberry label. And the fabric flower is absolutely stunning! Thanks for playing with The Paper Players! So gorgeous, Lea! There's nothing wrong at all with using mostly Crate Paper in my book! May I ask - what do you do with all the cards that you make? Hey Suzanne! Umm...well- I keep them around for a bit to send out for publication. The ones that come back from publication or just don't make it are sitting in baskets & boxes in my closet right now. I'm trying to find an easy venue to sell them in...I don't have the time for Etsy & such. So- right now they sit in my closet. So pretty! Fantastic layers and loving all the bits and pieces - the strawberry brad, the glittered thicker parentheses, just a great combination of lovely! This is so pretty, Lea!!! Love it! 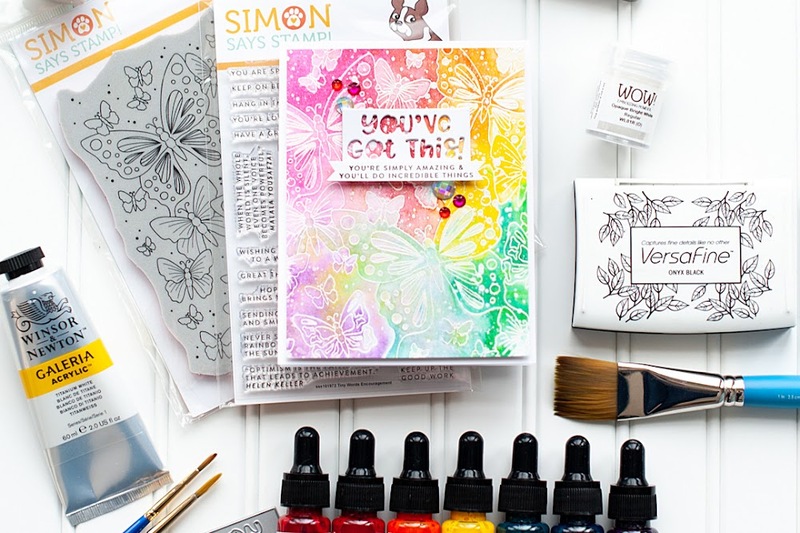 Thanks so much for playing along with us over at the Simon Says Stamp Challenge Blog! Lea, What a beautifully constructed card! The combination of words and images is very nice on this collage. Thanks for playing along with The Paper Players this week. Wow! Gorgeous card!! Love everything about it!!! 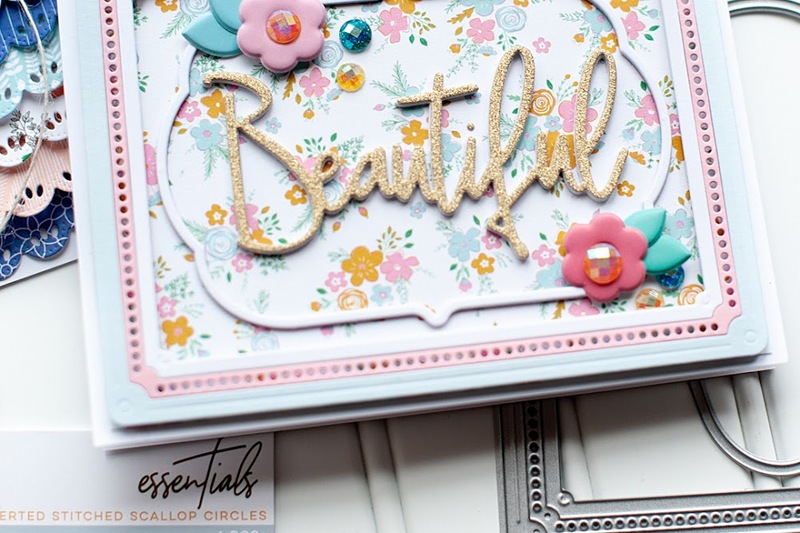 What a stunning card, your layering is divine!